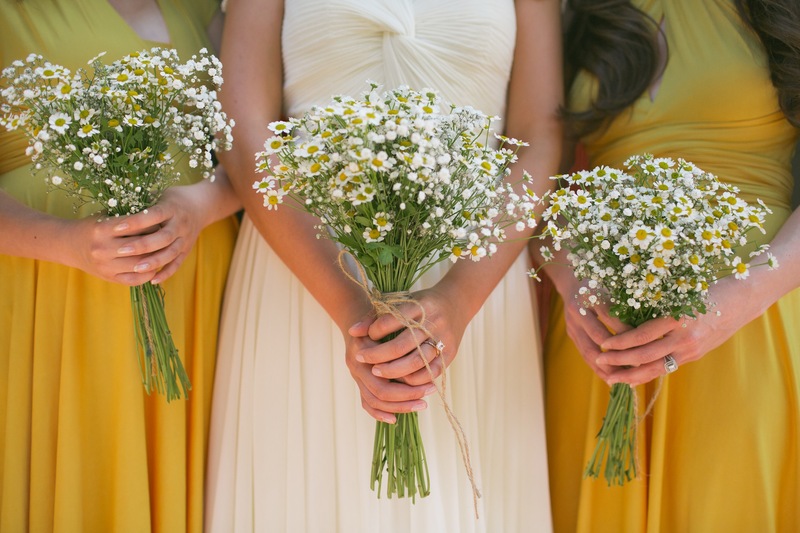 Your Personal Wedding Ceremony Planner – by A Day Like No Other! Congratulations – you are engaged! And you are beginning that whirlwind called “wedding planning.” Venues, caterers, florists, DJs… and then thousand other things. Believe it or not, the planning of the ceremony is rather a “second thought” for many couples. BUT… it’s at the core of the whole celebration – it’s the reason for the party! It’s the moment when you two are committing the rest of your lives to one another. So better focus on it right away! And since it’s such an important moment in both your lives, the person sealing your bond, your officiant, should be someone you trust, cherish, admire, or have been a friend with for a long time. The first and most important decision you have to make is whether you want a religious or non-religious ceremony. Both the Catholic and Protestant Church require the ceremony to take place in a house of worship; Jewish ceremonies may also take place outside a synagogue (at your reception venue, for instance). 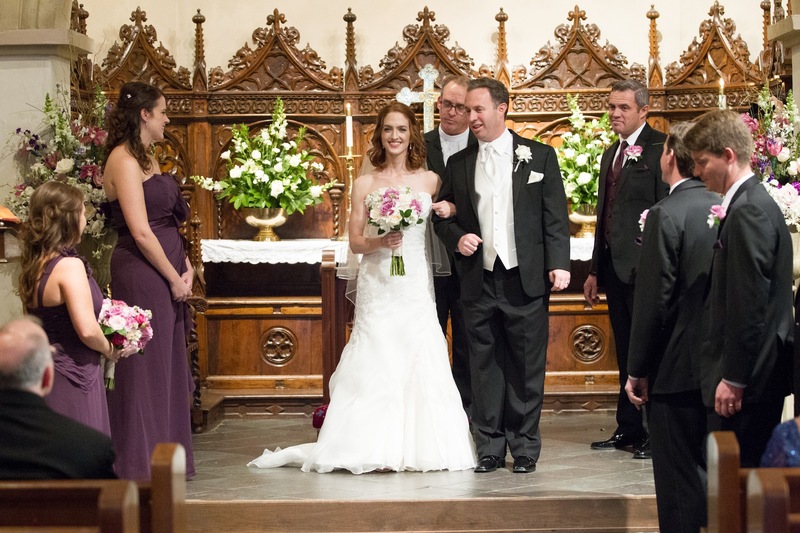 If you wish to get married in a Church of your faith, you will probably contact your parish or ask your parish priest to be your officiant at a different church; but in any case, you’ll follow the framework that applies within your religious community. You may choose one ceremony with a priest of each religion present, or two separate ceremonies (only one will then be legally binding by the signing of the marriage certificate). In many cases, premarital religious instruction is required, especially in the case of an interfaith marriage, and in some cases a Church ceremony even requires that the partner who is not member of this specific religious group needs to convert and become a member first, a process that can easily take up to a year. So better check this out, first thing! Your other option is to have a civil ceremony – and here the options are nearly limitless. To clarify: “civil” does not mean “non-religious;” it only means “not recognized as binding by an established Church.” You can have a non-religious, simple courthouse ceremony, or you can have a spiritual ceremony, even a ceremony following the Catholic rite, just not inside a Catholic Church, without the strict regulations, and consequently not recognized by the Roman Catholic Church (the White-Robed Monks of St. Benedict, for example, are monks following Catholic beliefs who will perform a Catholic wedding mass for you, anywhere you choose… it will be a legally binding marriage, but not one recognized by the Roman Catholic Church). 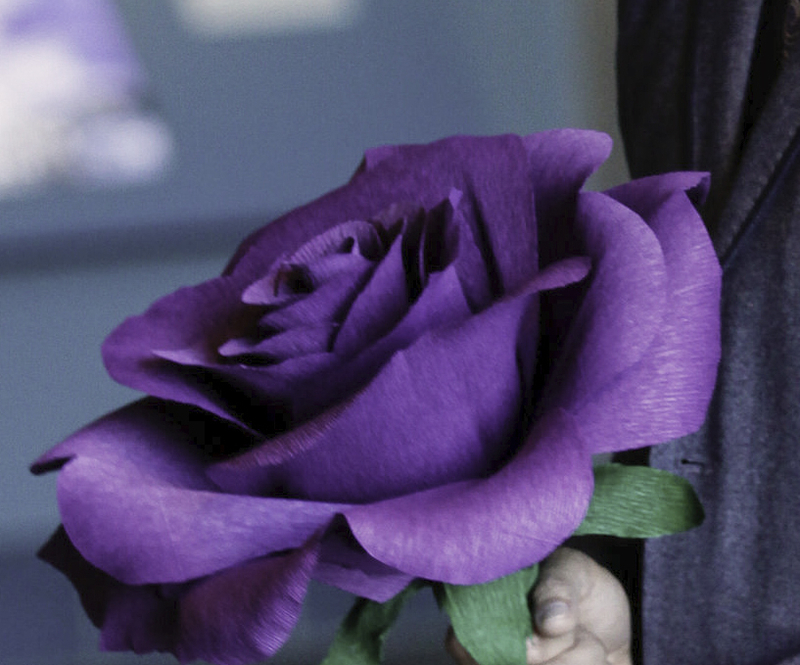 If you do not wish to be married by an ordained minister, even outside a house of worship, most judges or justices of the peace can officiate; and if you’d rather have a trusted friend or relative be your officiant, this person can become deputized for just this one day (at a very moderate cost, by the way). 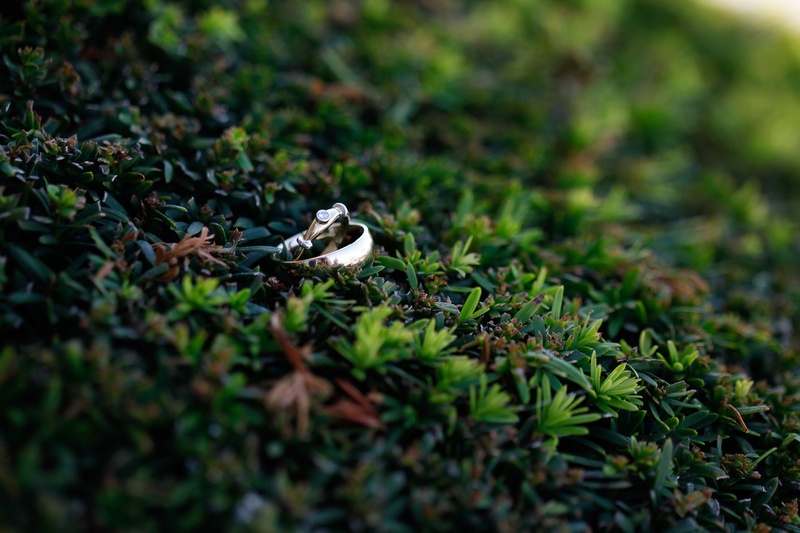 Or you may have observed an officiant at a wedding you attended and liked the way he or she conducted the ceremony – by all means, ask for referrals! Sounds quite complicated, right? 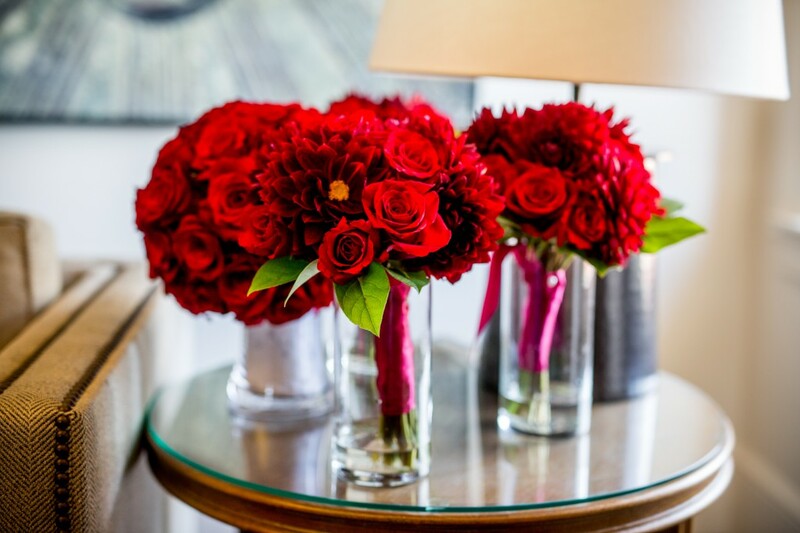 If you have a wedding planner (always recommended… after all, I am one myself! ), he or she can help you find exactly the right solution AND the right person. Once you have narrowed down your choices, I recommend that you meet each of the “possibles” with enough time to get a good impression of what this person is like and whether you feel well understood with your specific wishes and in your personal situation, and appreciated as persons. Ask about the way this person would conduct your ceremony or wedding mass, whether you can write your own vows, include rituals that are meaningful to you, readings by persons close to your heart; in short, find out what it would be like to be married by this person. Take your time; don’t rush it. No one can make that decision for you – this is intensely personal, and you’ll have to follow your heart here. Your chosen officiant may recommend premarital counseling (many actually offer this service) – and you should seriously consider this option. I assume your first reaction will be – “WHY? ?” The two of you are deeply in love, committed to one another – what is there to counsel? Well, of course you are right… but the sad reality is that about half of all marriages in the US fail and end in divorce, and it is safe to assume that all these couples were equally deeply in love when they said their vows, and still… and because this is so and because you do not want this to happen to you, it’s a good idea to at least consider premarital counseling. 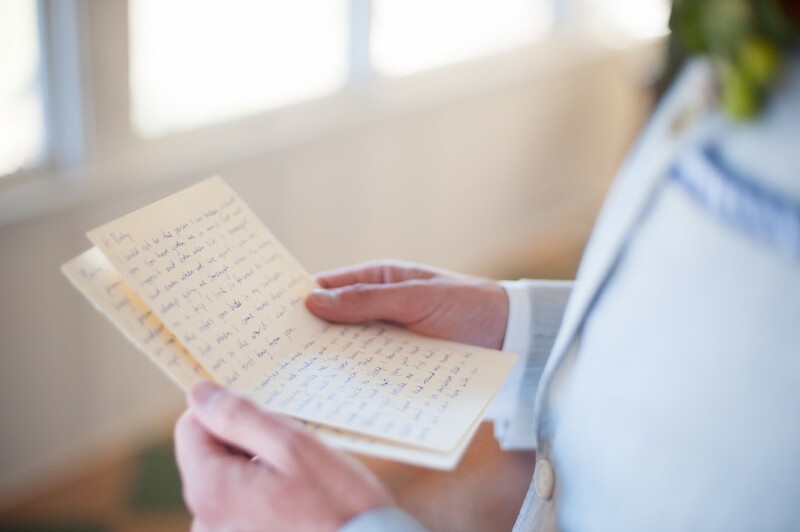 A bit of etiquette – depending on how close you are with your officiant, it would be a nice gesture to invite him or her to the Rehearsal Dinner and to the Reception. In many cases, officiants will politely excuse themselves due to “other commitments,” but it’s at least a nice gesture to offer it. And if they accept, they get a seat at one of the parents’ tables or other position for honored guests. If your officiant is a parish priest, a donation toward the Church is appropriate, and if he/she is not affiliated with a specific Church, you should show your appreciation with a personal gift. 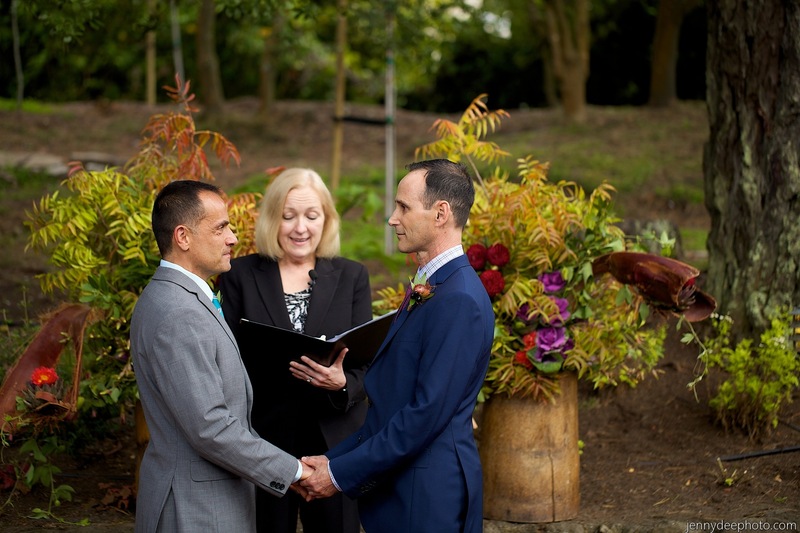 With your officiant and ceremony venue in place – whatever you choose – it’s time to think about your vows. Of course you can always follow the standard “I Do’s” – nothing wrong with that – but if you’d rather express your own unique and personal feelings, you have to put these in words, and, believe me, that’s not easy! Take your time for that. A good starting point is to write a love letter to your partner; leave it in your drawer for at least 24 hours, and then read what you wrote. That will be the essence of what to say in your vows. More details to think of: would you like to include readings in your ceremony? A favorite poem? Or maybe a favorite song or instrumental interlude? (And who would play or sing?) Would you like to include symbolic rites, like hand washing, ring warming, a sand ceremony, pouring wine ceremony, candle-lighting ceremony? There are so many ways to include your loved ones and even all of your guests and make them a real part of your ceremony and your union… just give it some thought! And with that, I’ll let you go, because I know you’ll be super busy… and you’ll have a wonderful, meaningful, unforgettable wedding ceremony! 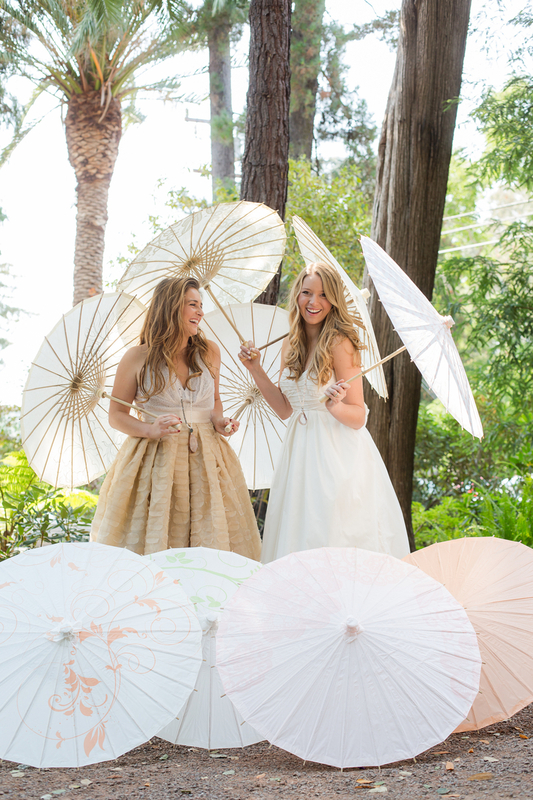 Feminine Charm and Grace – with Parasols by Design! 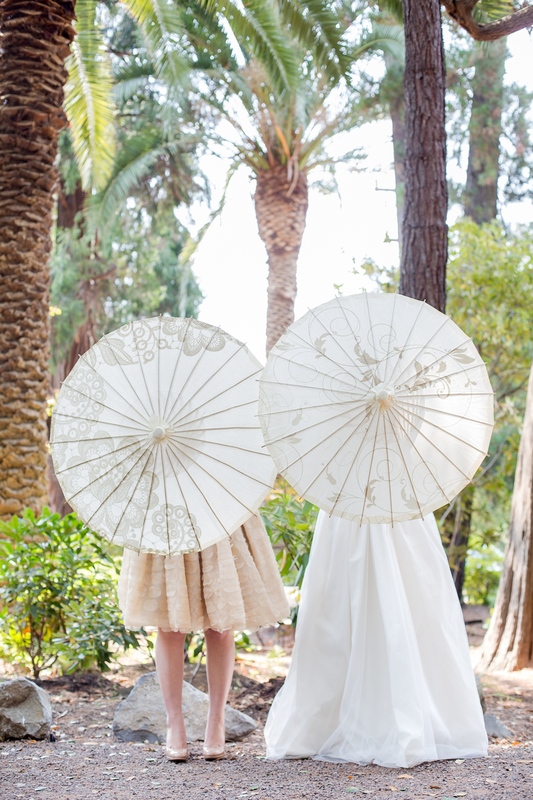 I have lately come across the most charming accessory for summer weddings: paper parasols! 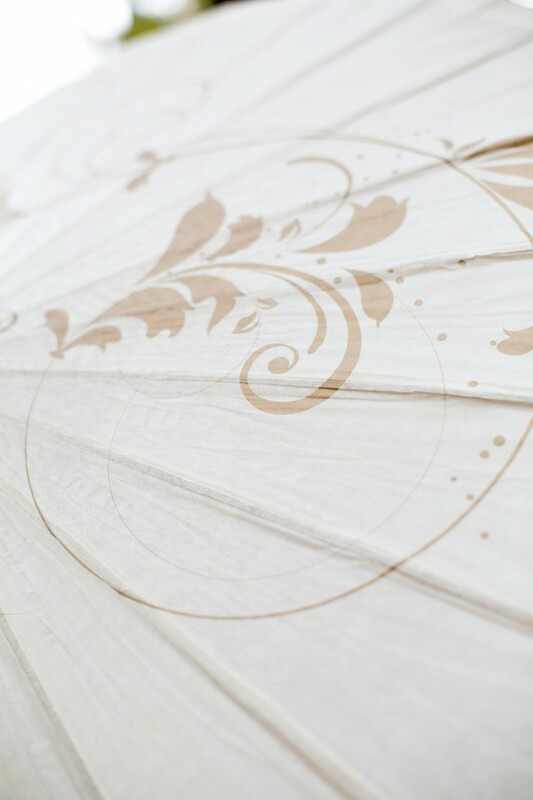 Not just any… but parasols by the design of Grace Dougan. 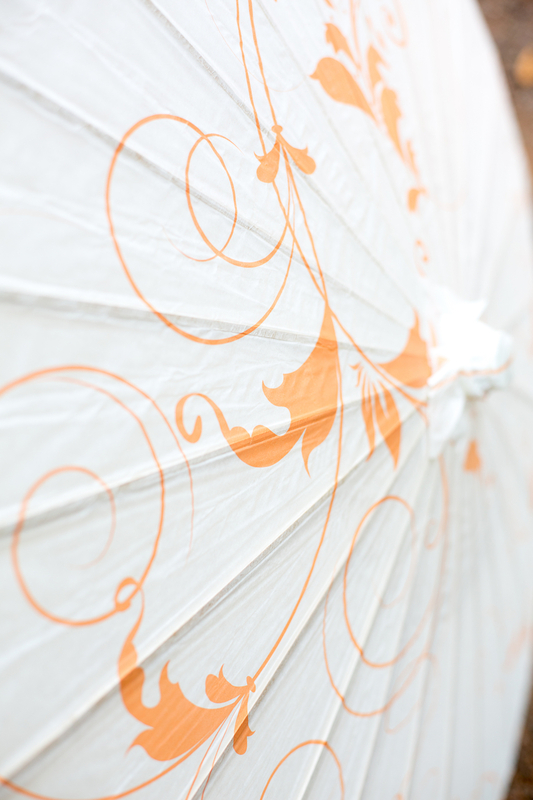 They are surprisingly sturdy, they provide much-needed shade at summery outdoor weddings, and they are simply pretty! Bride and Maid of Honor hiding behind elegant taupe swirls… and “peekaboo!” here they are – it’s just such a playful accessory! 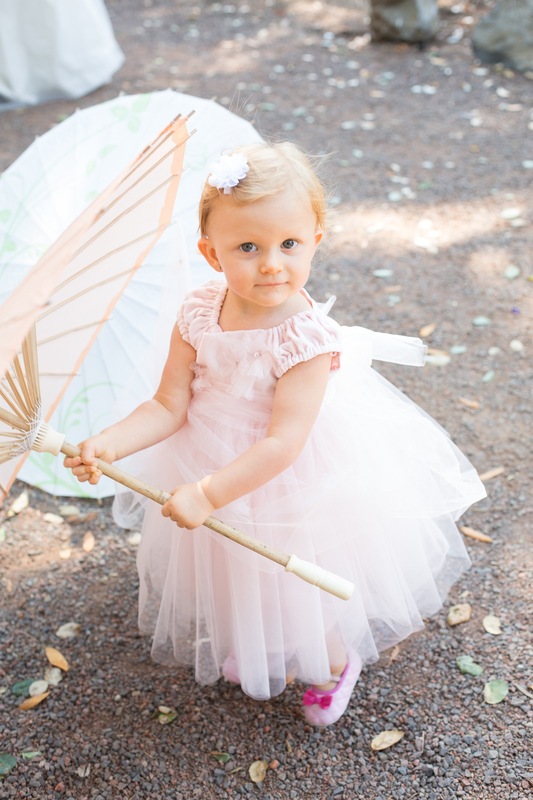 … and even little princesses love them! I am sure you are now totally smitten, too! 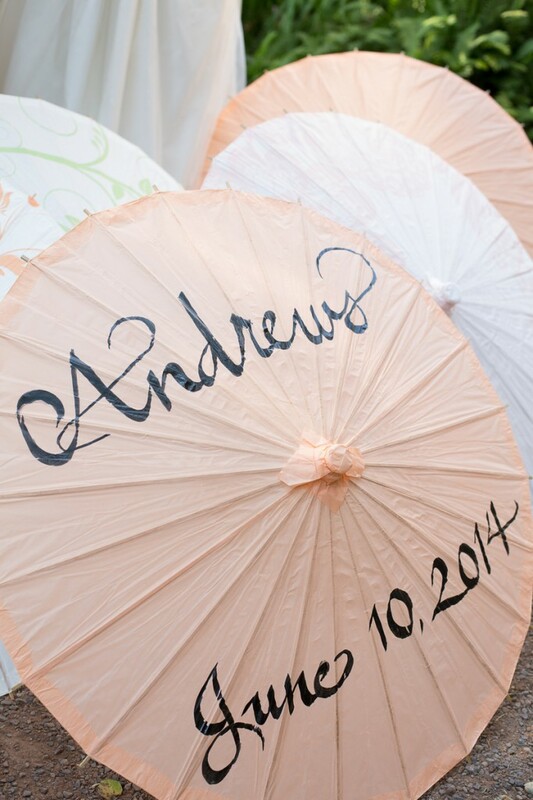 Look them up on Parasols by Design. I showcased them at my last festive WIPA event, and they were a real hit! 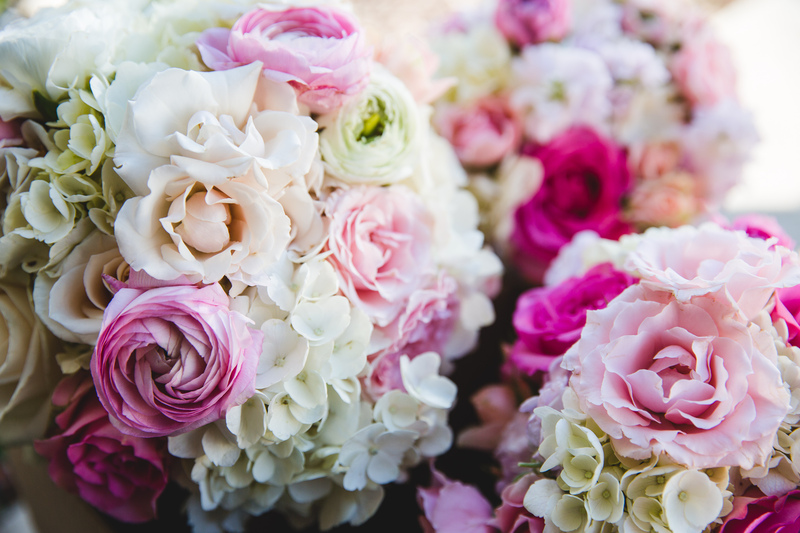 I’ll definitely use them in my own wedding designs, that’s for sure – and if I’ll hang them from the ceiling for a whimsical decor! 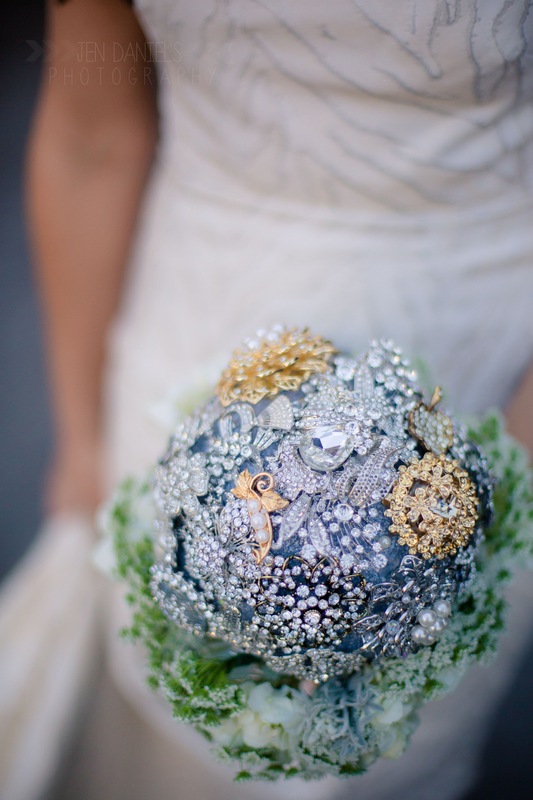 A “trend” is defined as a direction – and mostly understood as “something new,” like in “Fashion Trend.” Looking back on the 2014 wedding season, and especially on the variety of beautiful and unexpected dress choices my brides had made, I was wondering about their flowers. Trends? Not really. 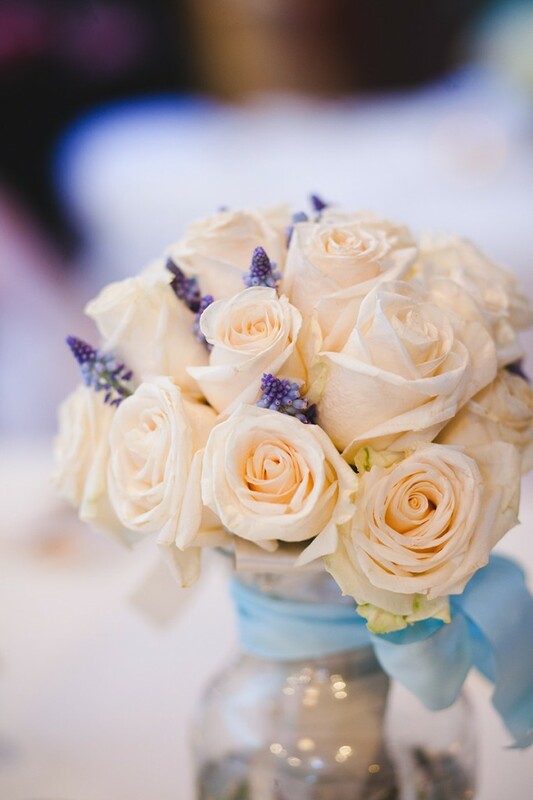 When it came to their wedding flowers, my brides were surprisingly conservative! 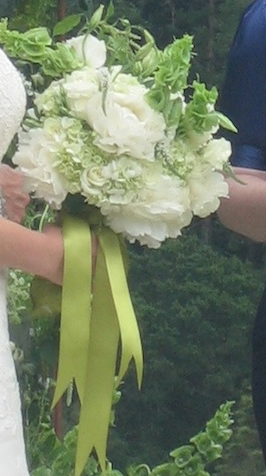 The undisputed winner of the year 2014 was the classic hand tied bouquet – mostly based on ivory and green, with accent colors. Very, very few exceptions… have a look for yourself. 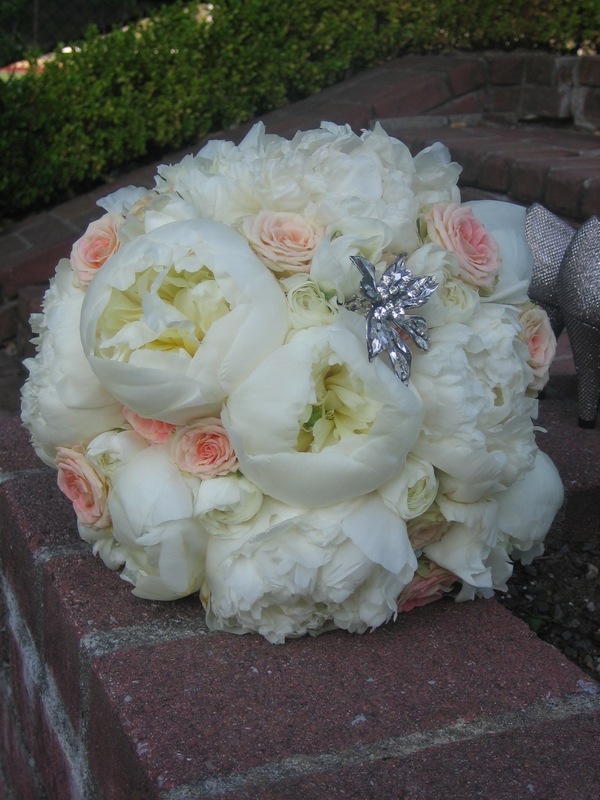 Angie’s ivory-and blush pink bouquet of roses and peonies to accompany her elegant summer wedding. 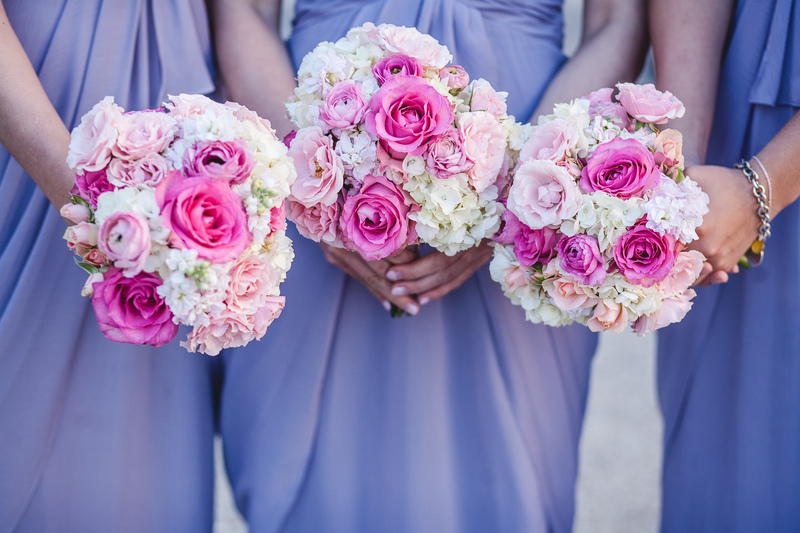 Shaina had likewise chosen pink hues for her accent color, and her and her bridesmaids’ bouquets (see those below) were based on English roses and hydrangeas in ivory and various shades of pink. 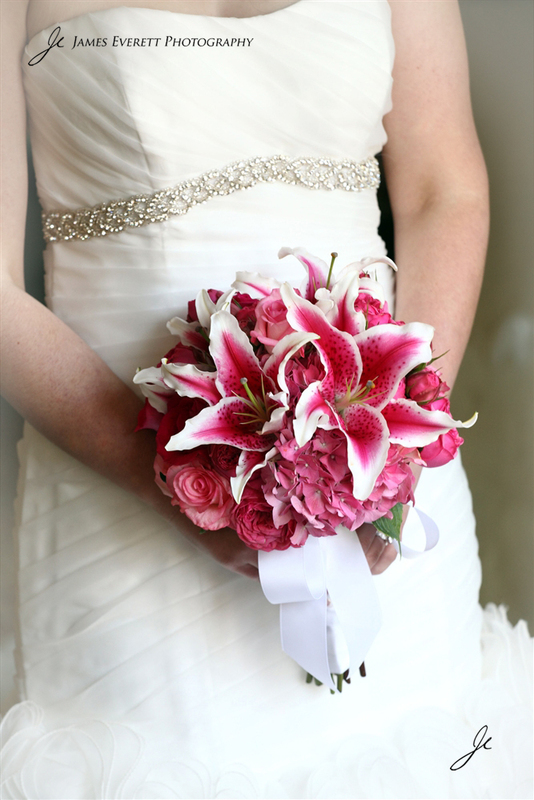 … and Laura chose hot pink as one of her accent colors, and her hand-tied bouquet consisted of stargazer lilies, roses and hydrangeas all in this color family. 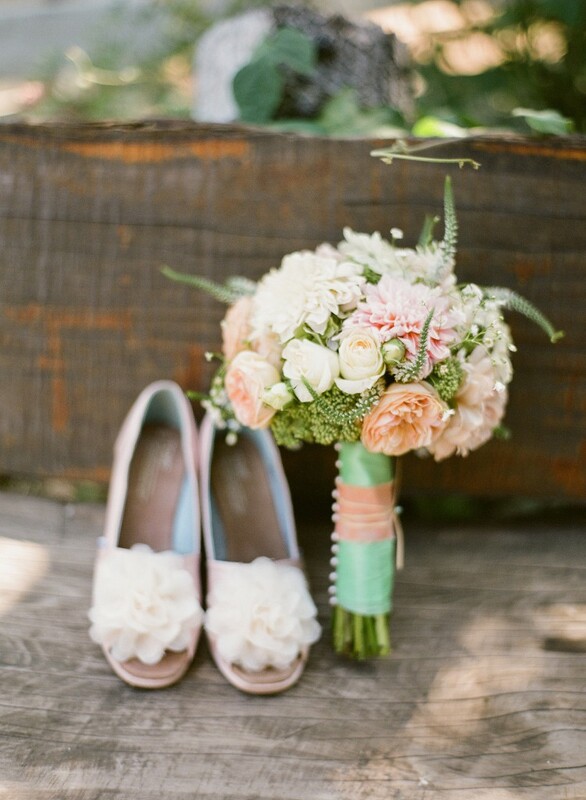 Which shows the versatility of this style! But still – wasn’t there a more adventurous style out there? 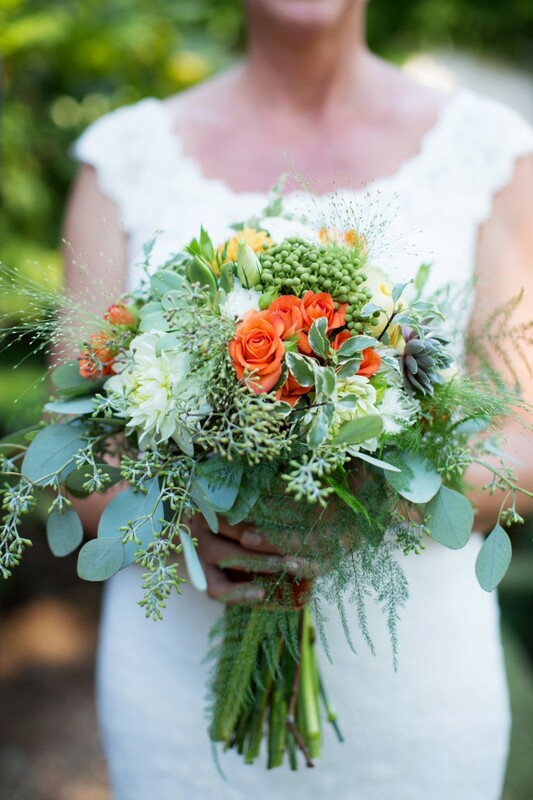 My “other” Laura went for a more relaxed, “wild” style for her outdoors vineyard wedding, with eucalyptus, succulents and berries mixed into the roses and lisianthus flowers. If any “trend” crystallizes here, it’s the succulents which have gained favor not only in table arrangements, but have made their way into the bridal bouquets, too. 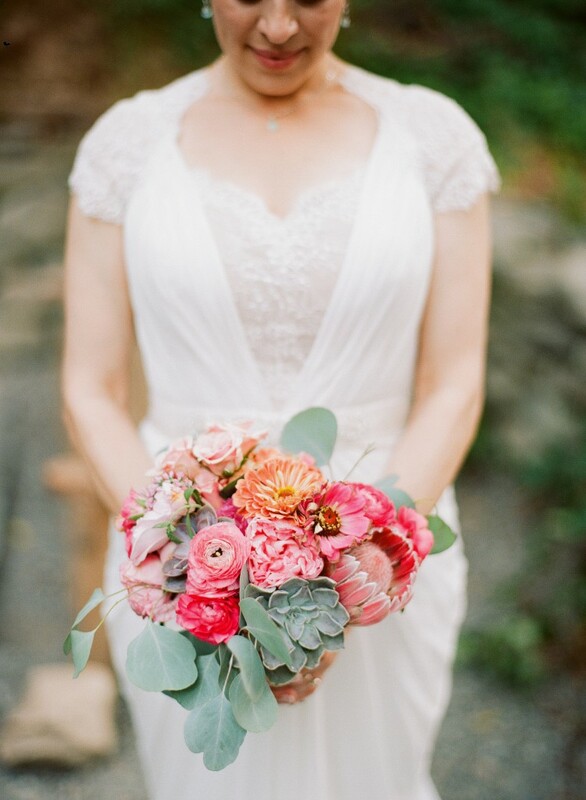 Amy fell in love with a combination of succulents, eucalyptus, ranunculus and exotic protea blooms in saturated pinks for her nostalgic outdoor celebration. 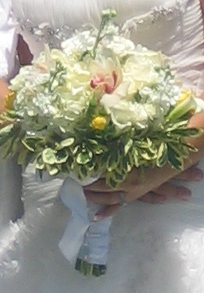 … and Vannie took it one step further: her bouquets were really “hand-tied” by herself, and with twine! What was NOT chosen? Well… no elegant straight bouquet of sculptural flowers (like calla lilies or long-stemmed roses); no cascading bouquets; and nothing “outrageous” like a flower lei in lieu of a bouquet. Maybe you, dear readers, are up for that? Let me know your favorites! 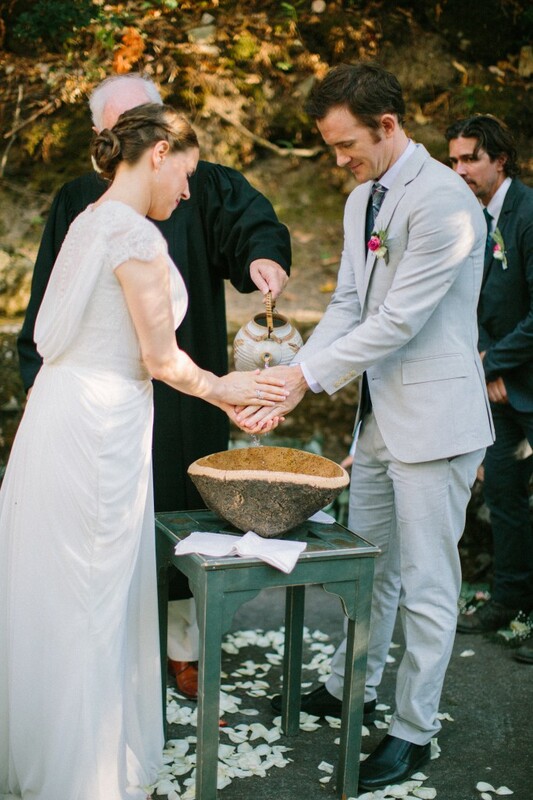 Hooray, Erik and Shaina – we are on Ceremony Blog! Congratulations to our elegant couple Shaina and Erik! 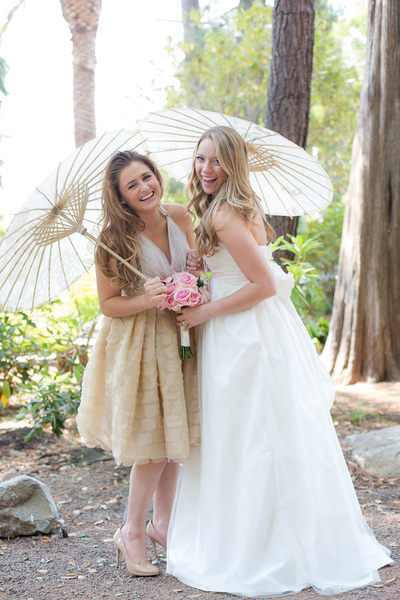 We all made it onto Ceremony Blog – check it out… it was a gorgeous, glamorous, big wedding. Sheer eye candy!